Hand Readings of famous people: Shane Warne's hands match his reputation! 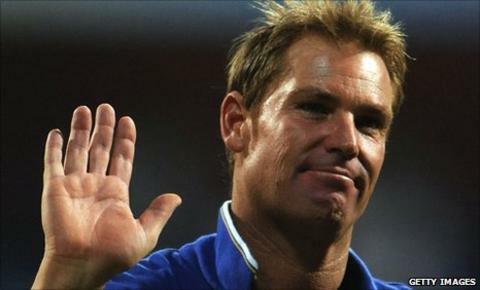 From what I could discern from the hand of Shane Warne, his hand matches his reputation. His hand is that of a temperamental person. It is not easy to decipher cricketers’ hands as most of their photographs are with gloves on. Reading Warne’s hands was difficult as I could not get the right photograph, one with the hand face up to the camera. So again, this is a limited reading. organizational and executive ability, common sense, and strength of will. It also shows astute judgment where people are concerned (Mercury finger and Mount). Moreover, it shows a person who loves people and gets along with them (shape of hand, Mount of Venus and Mercury). One would think that such a person would make an ideal captain of any team, but Warne has a weak side to his personality and that is probably what prevented him from reaching his potential in Australian cricket. Almost all his Mounts are well developed, the Plain of Mars in particular. His hand is also more developed at the bottom, with the Lower Mounts quite strong. This shows an amorous, excitable nature and also someone who is short-tempered. He has strong passions, but the question is whether he is out of control. Warne's hands do not show him to be a person out of control and nor is his hand that of someone who is impressionable or a person who gets swayed or carried away (like you see on Tiger Woods' hands). But it does show someone determined to get his way. This could make him more responsible for his actions than someone who is a victim of his feelings. Warne knows quite well what he is doing, and does it anyway. The shape of his fingers confirms that he likes the comforts of life a little too much and likes to indulge himself. However, the shape of his hand, the shape of the Mount of Venus and Heart Line shows him to be a good man, loving and very caring. The thumb is an important indicator of overall disposition. And when his thumb qualities are combined with the characteristics shown by his Mount of Jupiter and Mars, it translates into a person who is not just proud and dominating, but a person who can be short on temper and tact. People like him often rub people the wrong way as they are unwilling to kowtow to those in power. It is not as if his hands show him to be unreasonable, just intractable when he wants to be. This can often go against his own interests. Usually such qualities are tempered as a person grows older but I am unable to see Warne's hands clearly and cannot comment on the changes. Read about famous Indian cricketers: Rahul Dravid or Saurav Ganguly's hands reveal the secret of his success or Sachin Tendulkar's hands tell us who he is or about Sreeshanth's folly. Or check out all hand readings under the label of "Cricket" or the hand readings of other Sports Stars from other sports like tennis and football.